Today, 8 March 2019, is an important day for EuroVelo because it marks the launch of EuroVelo 19 – Meuse Cycle Route during the Cycling Tourism Day at ITB Berlin 2019. It is the first new route to be added to the EuroVelo network in three years! In this article, we introduce the new route and some of the many good reasons to go cycling along the Meuse. This attractive cycle route is already a well-developed tourism product, thanks to the work of several transnational partners over the years. The story of the Meuse Cycle Route began in 2010, when the city council of the municipality of Venlo (NL) started investigating the possibility of creating a continuous tourist cycle route along the Meuse. At a dedicated conference in 2012, 41 Dutch, Belgian and French partners signed a declaration of intent to express their support for the idea of creating an international Meuse Cycle Route. With the Province of Limburg (NL) as the leading partner, the route was developed and signed in 2015 and 2016 and promotional activities started in 2016. This resulted in a highly attractive cycle route that we are proud to include in the EuroVelo network! But what can you expect when cycling on EuroVelo 19 – Meuse Cycle Route? An ever-changing scenery with plenty of charming towns and villages on both banks of the river, cultural heritage sites to learn more about the region’s rich history and of course, culinary specialties awaiting you at each step of your journey. What about tasting French “dragées” and the famous “madeleines” of the Lorraine region before riding across the border to Belgium, land of the fries and the special beers, where each little town has its own brewery(ies)? History lovers will find plenty of activities in the French section of EuroVelo 19, as the cycle route visits Domremy-la-Pucelle, birthplace of the French heroine Joan of Arc, and Verdun, well known for giving its name to an important battle of the First World War. In Verdun you can visit the Underground Citadel which played a major role in this battle. Belgium will amaze you with its magnificent architecture, from the citadels of Dinant and Namur to Huy’s fortress and the town hall in Liège. And for the last stretch of the route in The Netherlands, the Meuse will reward you with unique views such as those of the Meuse Valley River Park’s landscapes and of the Biesbosch National Park’s wetlands. 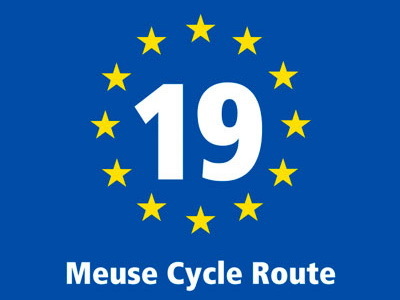 Finally, EuroVelo 19 – Meuse Cycle Route joins several other EuroVelo routes along major European rivers: EuroVelo 6 – Atlantic-Black Sea along the Loire and the Danube, EuroVelo 15 – Rhine Cycle Route along the mighty Rhine, and EuroVelo 17 – Rhone Cycle Route along the Rhone. In our experience, routes along rivers are very popular among cycle tourists, and we are confident that EuroVelo 19 will also attract its share of cycle tourists and local cyclists!